What is an aerating fountain? Which model do I choose if I need an aerating fountain? Any fountain that sprays water into air will aerate the water, however fountain manufacturers such as ourselves often differentiate aerating and lake fountains. 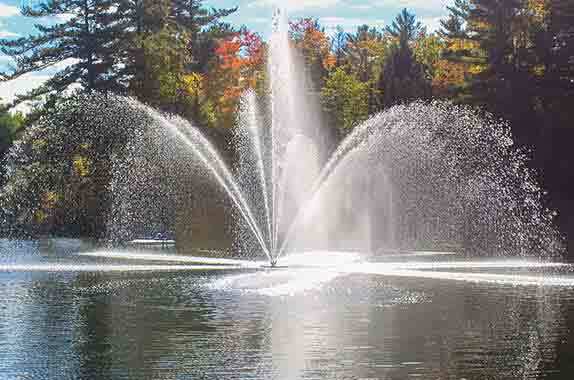 The main distinction of an aerating fountain is it moves a substantially larger volumes of water than a lake fountain. An aerating fountain is often called a surface aerator, floating aerator, aerating fountain, display aerator, pond aerator and many other variations. If you have been told you need an aerating fountain, it is probably because you’re experiencing water quality problems, such as algae. Arbrux pond aerators use a propeller to move large volumes of water to help solve water quality problems.